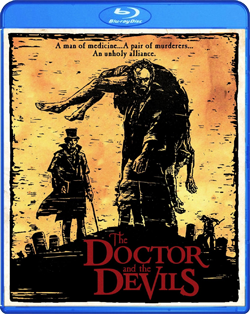 (Release Date: November 4, 2014)  "The Doctor and the Devils" is inspired by the 1828 Edinburgh, Scotland, crimes of William Burke and William Hare, Irish immigrants who claimed sixteen lives and sold the fresh corpses of their victims to anatomy professor Dr. Robert Knox. Director Freddie Francis (who previously helmed 1972's superbly gothic anthology "Tales from the Crypt") has altered the names of the grave-robbers-turned-killers to Fallon (Jonathan Pryce) and Broom (Stephen Rea), while the anatomist who hires them now goes by the moniker Dr. Thomas Rock (played by a pre-007 Timothy Dalton). "We are scientists, not moralists!" Rock says at one point, stubbornly persistent that he is doing nothing wrong by hiring Fallon and Broom since it is all in the name of advancing science and medicine. By going this aberrant route, however, he is playing with fire at the risk of his own job and reputation. Based on a screenplay by the late Dylan Thomas that went unproduced for thirty-two years, "The Doctor and the Devils" looks the part of a stately period drama and its actors (almost all of whom have gone on to illustrious careers) are more than equipped to fill their roles. One might assume that such lurid, daringly grim subject matter would be destined to breed a riveting film, but the outcome is curiously stodgy and lacking in dramatic verve. The characters, from Rock, Fallon and Broom to Rock's trusty assistant, Dr. Murray (Julian Sands), and Murray's prostitute paramour (Twiggy), are weakly developed and rarely given the chance to play more than one note apiece. The viewer waits for some energy and inspiration to come to the proceedings, but the movie remains a dull, uninspiredalbeit aesthetically handsomeexperience. "The Doctor and the Devils" arrives to Blu-ray with a satisfactory 1080p transfer that improves quickly after an iffy, dirty, gauzy, artifacts-heavy opener. This isn't a spotless image and the picture gives way to some inconsistent softness, but when it looks good, it looks quite impressive for a movie that is nearly three decades old. The image is frequently detailed and unmistakably filmic, with pleasing grain and resolved textures. The 2.0 DTS-HD Master Audio is surprisingly strong and almost bracingly active for such a dialogue-centric enterprise. The fullness of the group interactions in scenes set at gin joints, in college classrooms, and on the bustling, grimy city streets fills the home theater soundfield in a way that brings the Victorian era right off the screen. Dialogue is generally very clear, if a little thin during the final voiceover delivered by Timothy Dalton. "The Doctor and the Devils" was released on October 4, 1985, to little fanfare and minuscule box office. More drama than horror, the gruesome plot nevertheless ensures that it is an appropriate fit for Scream Factory. Kudos to them for rescuing this titlewhich had escaped my knowledge until this high-def release was announcedfrom total obscurity. While I wish I could say that "The Doctor and the Devils" is an undiscovered gem of the highest order, it is a regrettably stiff and mediocre affair. For fans, this is an excellent package with a few top-notch special features on top, and comes recommended. For everyone else, use a bit more caution.